The University of Delaware’s student-operated restaurant Vita Nova offers fresh gourmet cuisine prepared and served by UD hospitality business management students. As one of the items on the #UDbucketlist, dining at Vita Nova is considered a classic and unique UD tradition. Vita Nova is now accepting spring reservations for all who are interested in this Blue Hen fine dining experience. Located on the second floor of the Trabant University Center, Vita Nova will open for lunch starting on Monday, Feb. 12, and for dinner starting on Wednesday, Feb. 14. Chef John Deflieze notes there are several new additions to the Vita Nova menu, include dining options prepared with the sous vide (pronounced sue-veed) cooking technique. This cooking technique is used in high-end restaurants and will be an added educational opportunity for our students. The restaurant offers a gourmet buffet lunch Monday-to-Friday at 11:30 a.m. and elegant four-course dining Wednesday-to-Friday at 5:30 p.m. Vita Nova will offer private lunch meetings in the Bistro Room Monday-to-Friday from noon to 2:00 p.m.
Also on the second floor of the Trabant University Center, the Vita Nova Bistro offers a casual dining experience Wednesday-to-Friday from 5:30 p.m. to close, including a three-course menu for guests attending performances on campus, a small plate menu and extensive beverage selections. Again this semester, the bistro will collaborate with a number of UD art and music students to entertain guests for events like Theatre Nights, the Vita Nova Live concert dinner series and a special Art Exhibit in the bistro. For reservations, call 302-831-0500, email vitanova@udel.edu or visit Vita Nova online. Vita Nova lunch menus are posted weekly during the semester on the Vita Nova Facebook page, along with information about upcoming events and dinner menus. 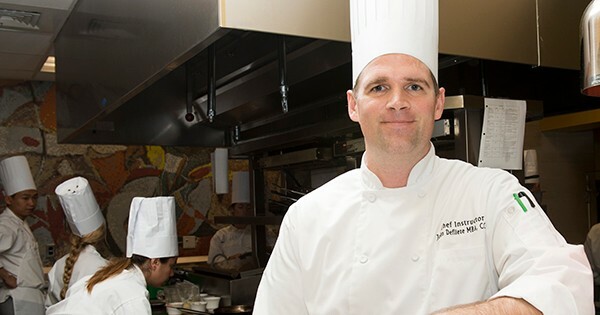 The Vita Nova restaurant lab is dedicated to educating tomorrow’s hospitality business management professionals and is part of the Department of Hospitality Business Management in UD’s Alfred Lerner College of Business and Economics.